In a large pot on your stove combine the lentils, water, onion, and garlic and cook for about 5 minutes. Add in the mushrooms, eggplant, pasta sauce, and nutritional yeast and continue cooking another 15-20 minutes until the lentils are soft. I used zucchini noodles for this recipe, but feel free to use any kind of pasta you like! I used one package of Cece’s Zucchini Noodles (16 oz) . Add one package of zucchini noodles to a skillet and 1/3 cup of water and cook for about 10 minutes until the noodles are soft. 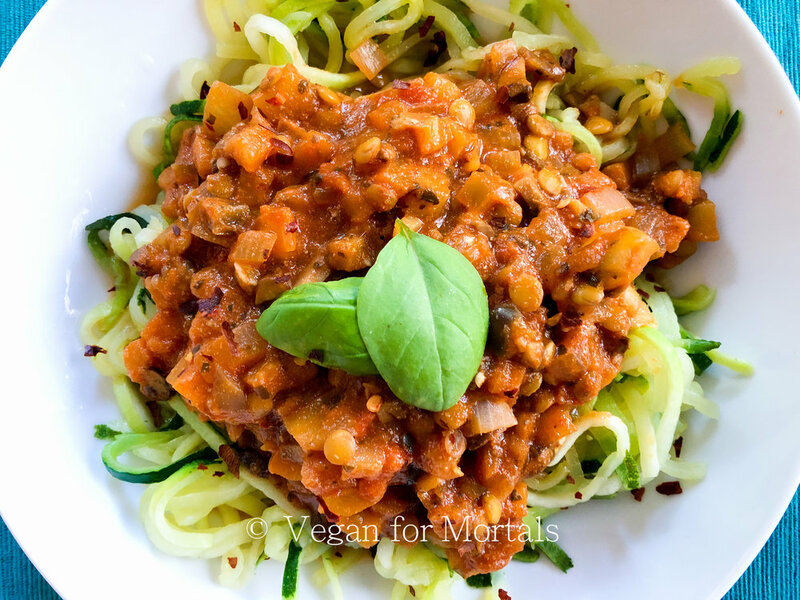 Top your zucchini noodles or pasta with the ragu and top with any red pepper flakes and salt and pepper to taste.